Inspiration and insight can come from all kinds of places. Nestled in my Google Reader feeds this morning was a blog from Robert Scoble called “The Chat/Forum Problem (& an apology to @TechnoSailor)“. Go and have a read – I’ll grab a coffee while you do. It drew me in because my experience of on-line communities is very similar to Scoble’s, and his description of the ebb-and-flow of user generated discussions really chimed with me. I also gave up on Usenet in the late 90’s, after it became a hideous, rancorous, bile-filled pit of trolls and spam. It still is today, apparently. What he identifies is that the first wave of people really enjoy their new place to link up and discuss, but it inevitable degrades and erodes as time passes and more people come in. mySpace is pretty much heading down now, Facebook is getting uncomfortably noisy, and I’m seeing much more pervasive spam and viruses on Twitter now than a year ago. They are all eroding. His point is that blogs don’t have this problem because they are curated, and focused and on subject, and free from all the cruft that accumulates when there’s no editorial control. Good bloggers get better and get more authoritative, and bad bloggers just disappear out of view. And I think it will be like this for radio too. 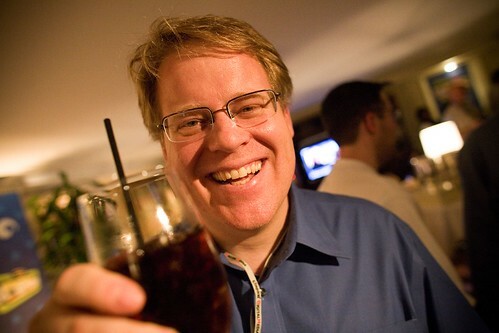 We’re just in the very early phase of the cycle that Scoble describes. Until 1990, there were only a handful of radio stations in the UK. Between 1990 and 1999, there was an explosion of broadcast stations, some of which have survived, and some of which struggle on today. In the last 10 years, the Internet has made distribution of radio (and music) easier, and contributed to an explosion of “like radio” services. In pure numerical terms, there’s never been more choices to listen to radio, music and audio, in an envrionment where the differences between the three have become blended to be almost invisible. That genie is out of the bottle. Radio, to its credit, has not engaged in the futile activity of trying to rebottle it, which at least shows we can learn from the mistakes of the music industry. (Note to media commentators – radio people are much smarter than you often give them credit for). The good radio stations have always acted as curators. What musos and pluggers deride as being heavy-handed playlist controls is curation that our listeners value. Some stations are more curated than others, but the principle is that rather than throwing people into a sea of music and seeing the majority drown, we create signposted swimming (and sometimes paddling) pools of music. Of course, there’s always room for the strong swimmers, who like to dive in and head out to sea, and the great thing about the Internet is that we can also service this small, but influential, group of people. (It’s the same in speech radio, by the way, but in my opinion Radio 4 has always been an Olympic sized swimming pool of speech content, and so it should be). If the future value to our listeners is in curation, that suggests that human-run radio stations will do better than automated-stations, and that stations with some controls will do better than those with no controls. Sure, there’s a bit of a whizz from the whole “it’s a station with no controls”, but the much vaunted Jack format which got so much interest for its “nobody’s in control” approach is just another station on the dial now. With relatively small shares in most markets. It’ll be interesting to see if services like last.fm, Pandora, speakr, mixcloud or even Dabbl will survive the first wave of interest, and genuinely make it to the mainstream. My hunch is that unless they become more like “radio”, they’ll shrink down to the niche after the initial wave of interest has passed. (Caveats apply – radio still has to be present, in a meaningful way, on digital platforms otherwise we can’t hope to compete at all, and we must understand that an essential facet of curation is to keep listening to our listeners, and filter out the irrelevant. Digital platforms, and services like Facebook and Twitter, can help harvest listener interests and sentiment, but it’s our job to organise and edit it). Of course, the one service I haven’t mentioned yet is Spotify, which is very much “like radio”. It’s certainly on the crest of a wave at the moment (giving away free music helps), but the problem Spotify seems to be grappling with is that the functionality that costs the most money – the ability to pick and choose songs – is the one that fewer people are using. Whilst the early adopters are enthusiastically engaged, the next wave of users seems to be sticking it on and letting it play like radio. Unless Spotify can drive a fundamental and radical overhaul of streaming music costs, they’ll go bankrupt from the negative gap between the cost of personalised streaming and the revenues from audio advertising. If if they do drive some sort of fundamental economic change, all the existing radio operators will be in a position to swap to the same deal, so it seems like Spotify (as a free service) is doomed. The tide is slipping away from them.